May 2008 bring some relief to the peoples of the world under Occupation, and to their Occupiers. 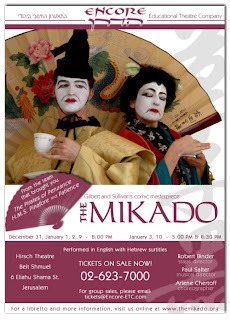 I hope my readers won't mind if I feature, for this New Year's post, a picture from the current production of Gilbert and Sullivan's Mikado at the Hirsch Theater by the Jerusalem Gilbert and Sullivan Society, of which I have been a loyal member for the last 24 years. This is a wonderful production with full chorus and orchestra. Anybody within 100 kilometers of Jerusalem should come and see the remaining six performances. For details, see the poster below. 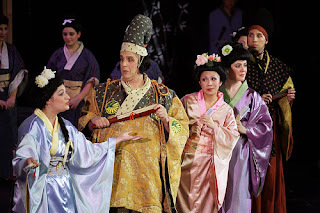 """the Jerusalem Gilbert and Sullivan Society, of which I have been a loyal member for the last 24 years.""" Clearly you do a tremendous amount for Israel. Back in the day Marxists used to say that ideology doesn't matter, all that matters is economic relations. How you live economically determines what class you are and how you impact the world. That was a very reductionist view. But overall I think that your ideologies as you express them cause no harm whatever. It would be a an interesting statement about Zionism today. Thank you, Jonathan, for considering me ineffective. We share something else in common, then. And Mr. "Zoot" -- I am not exactly sure about the relevance of Al Grand's work to Zionism -- there is Yiddish theater in Israel -- but any forum for a plug, I suppose. We almost included an encore verse for our production of HMS Pinafore from Grand's Yiddisher Pinafore, but none of us had enough time to learn it. Our three last performances have been jeopardized by the security arrangements for some hot-shot guy who will be staying at the hotel next door. It wont be the first time that the American president fouled things up, and probably not the last. you have a tremendous ammount of Hutzhpa. Being in some obscure cultural society (sorry MZ) for 24 years is exactly what really living in a country means. A society is made of people who want to live in it, and do what interests them in it. the GS society, if i understand correctly, gets a full house for every perfomance (mainly anglo immigrants who want to enjoy themselves for an evening). Sounds like he is doing more for Israel than a lot of complaining americans who don't even live in the country. So now you have to be a minister in order to do a tremendous ammount for ISrael? At least he is not speanding his time writing a billion comments on a blog he doesn't agree with. Is that the tremendous ammount that YOU do for Israel?